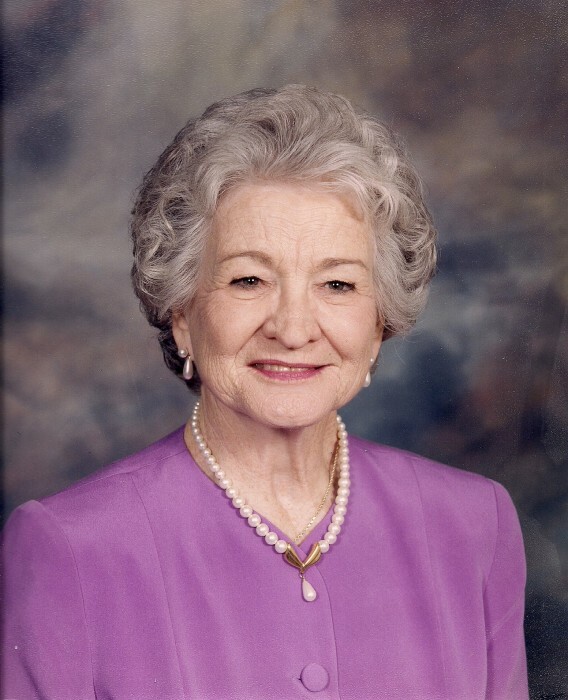 Wanda Rust Bowling, 95, went home to be with her Lord on April 10, 2019. She was a loving wife, mother, grandmother, great grandmother, sister, aunt and friend. Wanda was born on August 20, 1923, to Hubert and Sarah Ann Rust in Drumright, Oklahoma. She was the oldest of 7 children. Wanda loved school and was active in the Drum and Bugle Corp in high school. She graduated from Drumright High School at the age of 16. After graduation she attended Tulsa Business College where she received her certificate from the college. She won many awards for her incredible speed and accuracy in typing. From Tulsa, she moved to Seattle, Washington. It was at this job where she met the love of her life, Glenn Bowling. He was a Lieutenant in the Army and she was his secretary. They were married 3 months later and shared 49 wonderful years together, and were blessed with 6 children; Glenda, Clinton, Betsy, Sarah, Susan and June. Glenn's job with TransAmerica Insurance took them to many locations including Georgia, New York, and finally to Arcadia, California where they lived for 27 years before retiring and moving to Phoenix, Arizona, in 1989. They were able to enjoy retirement for 5 years before Glenn passed away of Leukemia in 1994. Wanda was an amazing cook, seamstress and devoted homemaker. She was most known for her amazing homemade biscuits and gravy. She was a very talented seamstress and sewed most her children’s clothes. She made beautiful prom dresses, a wedding dress for her sister and all the bridesmaids dresses. Wanda and Glenn were very involved in the churches they attended in each city they lived in. They made many friends everywhere they lived and always stayed in touch with their friends near and far. Wanda loved to travel. She was fortunate to have been able to travel to Europe, China, take cruises in the USA and other countries. As well as many trips to various locations in the United States. Every summer a road trip from the west coast to the east coast to visit friends and attend a family reunion. That tradition continued as the children grew and grandchildren were making the family grow. Wanda enjoyed taking a road trip or flying to be able to visit the friends and family she had in so many different parts of this country. Drumright, Oklahoma always held a dear stop in her heart, and she would visit often. She grew up during the depression years and lost a brother at a young age, but she always loved talking about where she grew up. She was excited to be able to attend her high school reunion for many years. The last one she attended was the 70th and she was so grateful to still have some good friends to share a life of memories with. She had many friends from Drumright that she remained in touch throughout her life. Her husband went home to be with the Lord 25 years ago and Wanda never remarried, instead she put her love and energy into her family. Wanda accepted the Lord Jesus as her savior as a young girl and trusted His love and sovereignty for her life regardless of any hardships. She was preceded in death by her parents, husband, 2 children, and 4 siblings. We can only imagine the great celebration she received when she was reunited with them all in in heaven! Even though we know we will be with her again one day, she will be deeply missed by all who knew and loved her. Wanda leaves behind her son Clinton and wife Evonne, and daughters Sarah and husband Rob, Susan and husband Steve, June and husband Larry, son-in-law Dan, as well as 13 grandchildren, 7 great- grandchildren, 2 sisters and numerous nieces, nephews, and extended family.